After two hectic years of working as correspondent for YLE in Washington, I finally found time for a DXpedition across the Atlantic, so you can imagine my excitement - I just couldn't wait to get to Lemmenjoki again. After flying to Helsinki, I first spent a week running errands and catching up with friends and relatives. 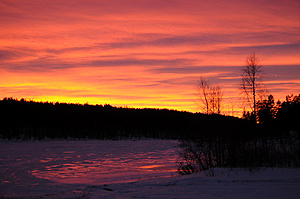 We celebrated Christmas with family in Tampere on Christmas Eve, as our tradition is, and on Christmas Day I headed north. 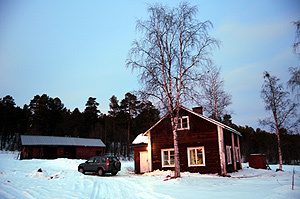 My jetlagged internal clock was already way off any nearby time zone, so rather than just lay awake in the middle of the night, I packed my wife's Chrysler Voyager and began driving to Lapland at 4:30 a.m. on December 25. This was probably the most quiet time of the year on the road. During the first 100 kilometers from Tampere to Jyväskylä I saw only two other cars, although this is one of the main arteries leading north. Weather conditions were pretty good, and so I drove 520 km (325 miles) without stopping before refueling myself and the minivan at Autokeidas ("Car oasis") in Ii - yes, this shorty is the real name of the place, north of Oulu. Driving to the next stop Kittilä was a pleasure as there was some daylight much of the way. I finally arrived in Lemmenjoki around 7 p.m. in the evening. Not all reindeer seemed to be assisting Santa Claus, as I saw many on the roads of Lapland. 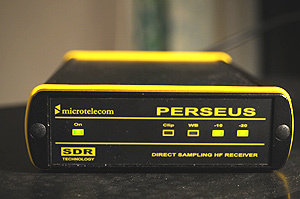 Just before the DXpedition I bought the Italian-made Perseus receiver which is capable of recording the entire mediumwave band. I knew this would change the very nature of DXpeditioning, taking SDR receivers to yet another level, but unlike some others, I view this more as an opportunity than a threat. Perseus turned out to be quite a time machine, enabling me to focus on monitoring subtle changes in conditions, while postponing the identification of individual stations to some distant point in the future, when I would be able to actually listen to the thousands of hours of recordings. Of course, with this amount of recordings, it is impossible to listen to even most of them, and so your DX instincts come to play when determining what to concentrate on. Polar night at Lake Kuivajärvi, just outside the Lemmenjoki cabin. Perseus required a pretty powerful computer, so I needed to buy one more laptop, which I sold to Jari after the DXpedition, as I probably wouldn't need one in about a year. 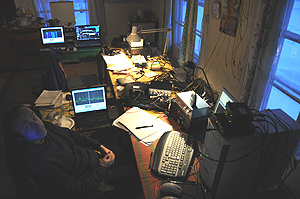 In addition to the Perseus, I had two SDR-14 receivers with laptops, so tables in Lemmenjoki were covered more by computers than receivers, and the floor was littered with 1TB hard drives. Just putting it all together and trying to figure out various software-related problems took many hours, and even later on, the computers tended to crash occasionally. Playing with antennas occasionally crashed Perseus, perhaps because of some electric spike, and as can be expected, this usually happened just before the top of the hour. However, I don't worry about the possible missed catches, because in any case I already have much more recordings than I can handle. Jari was equally well-equipped with a total of four SDR-14 receivers. The first day was partly spent on interference-management. I had hunted for spare power supplies to get rid of a newly discovered local interference source in Lemmenjoki and had it eliminated. 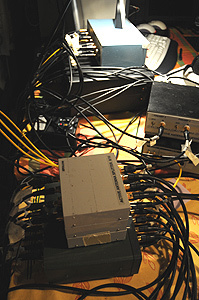 A much more distant interference source was digital hash caused by IBOC, the digital "HD Radio" system used in North America. IBOC was a growing nuisance, effectively wiping out many weak stations. Unfortunately there's not much we can do about it, other than hope that the broadcasting industry will eventually come to realize that IBOC is technically flawed, as well as a marketing disaster, and overall a huge waste of money. Not that DRM in Europe would be much better, and causes equally severe interference on the European AM dial. Fortunately there are still relatively few DRM stations on the air. 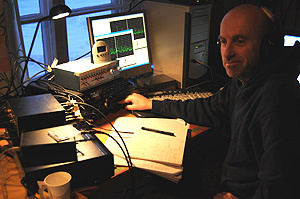 Over the course of the DXpedition, the few daylight hours were partially used to check antennas, which were mostly rebuilt in 2007 and were in great shape. One of these new antennas points at 319 degrees, and was normally the most effective wire for North American stations. Honoring the utilitarian tradition of Lemmenjoki DXpeditions, this was not a culinary expedition. Anything that comes in a can and can be microwaved and consumed wasting minimal time is ideal, but some delicacies are worth mentioning. Exposed as I was to the North, I was powered by Sarah Palin inspired moose sandwiches (no, we didn't shoot the moose from a helicopter), salmon, bear paté, wood grouse, cloudberries and other Arctic delicacies. Weather changed from one extreme to another; first several days around and above freezing point, which is rare on these latitudes, then a fierce blizzard that doubled the snow cover, followed by freezing temperatures of -20 degrees. On arrival, space weather conditions were quiet, but reception conditions were only mediocre, and frankly, remained quite boring and predictable for several days. Later on, a recurring coronal hole arrived as expected on New Year's Eve, and shifted conditions, but didn't bring about any major outburst of signals from some specific direction. However, signal levels from all directions improved. 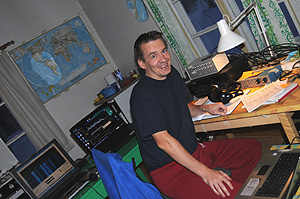 Jari Ruohomäki, who joined me also on my two previous end-of-year DXpeditions (see reports of LEM239 and LEM220) arrived two days later on the evening of December 27, and this is when the real action began. 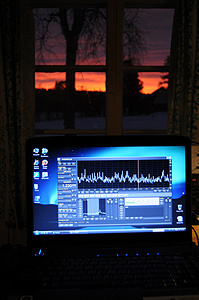 As it was the last week of the year, there were many other DXers in action around the Nordic countries, and comparing our results especially to those in Parkalompolo in Sweden (see PAX80 DXpedition report in MS Word format) gives an interesting look at how big a difference a small distance (200 km southwest) can make. Both crews were equipped with the latest in SDR technology, so the logs pretty well reflect what was audible at any given time. Some Asian stations were heard on the previous evening, Dec. 25 around 2200 UTC, and a handful of U.S. stations from the Great Lakes around 2200-2300 UTC. Overnight the most common Puerto Rican and Venezuelan stations came pretty well, and around 0730 UTC there was a brief opening to southern Brazil and Uruguay, especially in the lower end of the dial. Sporadic East Coast stations from North America were heard through the night, but when conditions improved around 0800 UTC, conditions stretched from the Great Lakes to the West Coast with most of the usual suspects audible. Stations from the state of Washington were the last to vanish around 1500 UTC, including KVAN Burbank on 1560 kHz, a new one for me, because I hadn't been able to DX since this relatively common station was launched in early 2007. However, signals were weak most of the time. Asian stations, mostly Chinese, began to fade in around 1200 UTC, and continued past 1500 UTC, gradually swamped by Europeans. A handful of the most common Alaskan and Hawaiian stations were heard, but nothing noteworthy. I had set an alarm to wake me up just before 2000 UTC on Friday evening to monitor possible daytimer conditions, but already at this point of the DXpedition, I was just too tired and overslept. When I finally woke up at 0100 UTC, a few of the most common American stations from Venezuela to Newfoundland were audible. Venezuela and the Caribbean began to improve at 0500 UTC, with the occasional East Coast station in the mix, when a sliver from New York to Newfoundland was audible. KPNP Watertown MN on 1600 kHz was the most Western station on the dial in the wee hours, while Albertan powerhouses began to emerge around 0600 UTC. Overall, stations around 700-900 kHz were the strongest early in the morning. The first Cuban, Radio Reloj on 570 kHz, emerged at 0630 UTC, and conditions began shifting. At 0715 UTC the very low end of the AM dial opened, but unfortunately tilted towards the Canadian West. During the daylight hours I was doing antenna maintenance at a remote monitoring station some 60 km away, so it remains to be heard what my SDRs have captured. As evening fell, Chinese stations were strong, and later around 1600-1700 UTC many Australians were noted on the X-band. Late evening, Chinese stations made a strong comeback at daybreak in China around 2300 UTC. Overnight a thin selection of sporadic trans-Atlantic signals didn't cause much Saturday night DX fever, so we caught up on sleep. In the morning, East Coast North American stations began to improve after 0500 UTC, with the rest of North America and Cuba adding to the mix an hour later. Conditions favored Ontario, so we focused on getting the remaining Canadian X-band stations, including CINA Mississauga ON on 1650 kHz which had begun broadcasting a week earlier. By 1000 UTC conditions had once again shifted towards the northwestern corner of the U.S. Most American stations vanished after 1200 UTC, but at the same time Chinese stations - with a few Philippine, Thai and Japanese stations in the mix - strengthened. Unfortunately this didn't last long, and by 1300 UTC Europeans had mostly reconquered the dial, and the DXing day was over. I woke up just before 2100 UTC to keep a watch for daytimers, but didn't find any, although some of the most common East Coast stations began to emerge during the following hour. Stations from the East Coast, the Caribbean, Venezuela and Colombia gradually gained strength, but I was most happy with a lone shortwave catch, GTRK Magadan on 7320 kHz, finally audible during a local slot at 0210 UTC, after years of trying. Conditions were somewhat boring and followed the pattern of previous days; focus in the Pacific Northwest, weak signals overall, and the usual suspects dominating, before North American stations gradually faded out around 1400 UTC. Among the catches were KSUB Cedar City UT on 590 kHz, KVNU Logan on 610 kHz and KALL North Salt Lake City UT on 700 kHz, all around 0900 UTC, when conditions favored the Rocky Mountains. Asia was a tad more interesting. There was a short opening around 1000 UTC (including HLKQ Cheongju on 1062 kHz), but then stations disappeared before the usual mix reappeared along with Europeans later in the afternoon. The first trans-Atlantic signals emerged around 2000 UTC, but the few U.S. stations were very weak. Around 2200 UTC conditions shifted towards Venezuela, Colombia and the Caribbean, with relatively strong signals for a change. Reception continued to improve, and this turned out to be the most interesting DX session of LEM271 so far. Identified stations included HIMS Radio Crystal, Santo Domingo, on 570 kHz and three Colombians on 1060 kHz (see box below). In retrospect, this opening turned out to be even more productive than I originally thought, bringing about dozens of interesting stations from Puerto Rico, the Dominican Republic, Venezuela and Colombia. One of the most interesting frequencies this night was 1060 kHz, where I eventually, after the DXpedition, identified Radio Amanecer from the Dominican Republic, as well as Radio Furatena, Radio Litoral and RCN from Colombia, all within two hours. Radio Litoral turned out to have a very colorful website, but no contact information. Fortunately they had a chat room, which seems increasingly popular among Colombian stations, so I began fishing for an email in the chat room. Initially they were very suspicious - why would somebody in another country want their email. When I finally convinced one of the DJs to reveal his email, I sent the reception report, and waited a while, enjoying the internet feed of "Litoral TV", which mixes live studio view with music videos and travel promotions. Later I asked for confirmation in the chat, and got a chat QSL, the first of its kind for me. My reception report was also discussed on the air, which I was able to record, thanks to the streaming audio. This excerpt (MP3) contains also the sound bites which I had sent along with my reception report. Also Radio Furatena ended up sending greetings (MP3) on the air, which I was able to record over the web feed. QSLing can sure be very different from what it used to be! In the morning some Cuban stations were heard past 1000 UTC, but we didn't notice any interesting ones. U.S. stations strengthened at daybreak (including WNED Buffalo NY 970 kHz) and continued past 1500 UTC. Thanks to a tip from Jim Solatie, Zenith Classic Rock from Ireland was caught on 1584 kHz, luckily on a day when signals from the British Isles were stronger than on any previous day. First trans-Atlantic signals appeared on Tuesday evening after 2200 UTC, initially from Brazil and then also from North America, focused in the MN-WI-ND region. At least one daytimer was detected, but no IDs. Signal levels were consistently poor. After 2330 UTC there were a couple Argentinian X-banders among European pirates. Trans-Atlantic signals began to take rapid turns appearing and disappearing instantly. These changes in propagation intensified in the morning. One minute the band would be full of hiss, and soon full of stations. According to the Finnish Meteorological Institute, monitoring space weather nearby, magnetic activity level here in Lapland increased sharply at 0100 UTC, but began to settle down already at 0800 UTC. Kind of fitting that at the same time a fierce snowstorm began to rage outside after several unusually mild days. In the morning, Spanish stations were heard at the 0650 UTC regional break, including the elusive RNE1 Extremadura, Badajoz, on 648 kHz, and we belatedly noted an opening to Brazil which ended at 0800 UTC. U.S. catches in the morning included WTCM Traverse City MI on 580 kHz with no sign of CFRA, which was rare. Because of the nature of propagation conditions, New Year's Eve was really the first time that we were able to listen to graveyard channels and actually get something a bit more interesting than the dominants, such as KCID and KEYG on 1490 kHz. A handful of common Japanese and Chinese stations surfaced very briefly around 1030 UTC. Lousy start for the new year, with only a few weak Brazilian stations during the night. Brazilians improved somewhat during the morning hours until vanishing around 0745 UTC, but virtually nothing else was audible from the entire Western hemisphere. Daytime was dead quiet, and by late afternoon only a few most common Pacific Northwest stations were heard. Asian stations initially became audible only around 1230 UTC, and even then a mixed bag from Japan to Saudi Arabia wasn't very exciting. Much later in the afternoon Asian stations made a comeback, but with a wide focus, and the most exciting target were Australian X-band stations. No sign of North American stations overnight, but it was compensated by the emergence of Brazilian stations, which were stronger than on any previous night. Brazilians continued until about 0800 UTC, and then North American stations swamped the dial. For example Rádio Globo, Fortaleza CE, was heard on 620 kHz, and KGVW Belgrade MT on 640 kHz. During the daylight hours graveyard channels were open better than on any previous day. Although we didn't hear anything really exciting live, at least it will be a joy to listen to the recordings, which I hope will be unlike the barely audible signals during most of the DXpedition. Asia was once again a disappointment. South American stations became audible around 2300 UTC on Friday evening, and remained on the dial until past 0800 UTC, with the best conditions after 0730 UTC. For example ZYK649 Rádio Onda Viva, Presidente Prudente SP, was heard on 1300 kHz, and CB133 La Mexicana Radio from Santiago, Chile, on 1330 kHz. Argentinian X-band stations performed well, presenting an interesting target, and for example Radio Guaviyú was identified on 1610 kHz. After 0800 UTC the Southern part of South America began to fade out, and there was a very brief opening to Venezuela, after which North American stations started to dominate the dial. Signals however faded out very early, well before midday local time, so at midday - the scheduled changing of the guards - it was painless to unplug our receivers, and start packing. As soon as we were out of the door, Jarmo Patala and Vesa-Jussi Rinkinen who formed the LEM272 crew, began to set up their impressive array of four(!) Perseus receivers ready to copy the entire dial many times over. Overall, our catches are not much to brag about, but we still have enough recordings to chew for the rest of the year, and, thanks to great advances in SDR technology, once again the amount of recordings rose to a new record. I better not even try to count how many tens of thousands of hours it would take to listen to it all, so hard choices will need to be made. In addition to catching new stations, visiting Lemmenjoki and experiencing midwinter Lapland was of course a welcome break to everyday life. 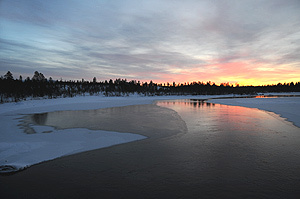 The attached photos hopefully convey some of the magic of the polar night in Lemmenjoki.